Fort Worth/Dallas is steadily becoming a hub for small and large real estate agencies in Texas. The city is already making steps towards achieving more amicable and conducive real estate environment. The recent developments involved making Fort Worth office space green through the 2015 Green Adoption Index. Most analysts acknowledge that Different types of Office space in Dallas could attract more investors and companies who need it for commercial purposes. In 2014, Dallas/ Fort Worth posted an impressive 140,000 employment growth. The labor retention rate was also on the rise. These statistics reveal that businesses are booming in Dallas/Fort Worth. Everybody is moving to this place because Texas has a conducive business environment since it does not have an income tax. The cost of living is much reduced and the environment is quite cozy for living and working. Companies also like the place because of its proximity to Houston which is an economic giant in the region. The area is currently experiencing an economic transformation that has triggered migration of companies and people. This has caused a positive impact in commercial real estate market making it a stable and promising industry. The relocation growth experienced since the 2008 economic recession has enabled the companies to find a suitable place and created numerous employment opportunities. Apart from a conducive environment and labor availability, Dallas/Fort Worth has other necessities such as nearby airports, great housing choices and modern restaurants that make it a living paradise. When you talk of Dallas/Fort Worth commercial real estate among real estate savvies, you will unknowingly create a buzz. It is not secret that Dallas real estate is hot with experts claiming that 2015 was the hottest. Dallas is currently neck to neck with Houston when it comes to newly completed commercial office spaces. This has hugely influenced corporate relocation to the area. According to experts, Dallas/ Fort Worth commercial real estate future is bright. The place is expected to transform into a beehive of business activities supported by a large civilian workforce. Dallas/Fort Worth is well known for its numerous and efficient educational institutions that produce highly skilled graduates ready for the job market. This is among several factors that have made both large and small companies yearn to establish a business in this locality. The place also swarms with large insurance companies, hospitals, financial institutions and IT services. The recent news about Toyota and Liberty Mutual relocation to this area will increase the job opportunities and expand the real estate market. 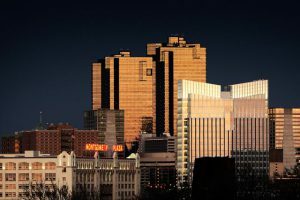 Luckily, Fort Worth has a pool of able individuals supported by a strong real estate market to handle the current relocation of corporations and small businesses. The area needs a lot of parking space plus more than 100,000 square feet commercial Fort Worth office space. The commercial real estate industry has already planned to build 5,000,000 square feet of modern buildings by the end of 2016. This will keep the real estate market flowing freely and efficiently. With the best living condition, labor availability, the presence of social amenities and excellent infrastructure, Dallas commercial real estate shows no signs of slumping. Workers, companies and other investors will still continue to flock North Texas. Stopping this trend is not possible with any kind of effort applied. The only thing you can do is sit and watch how the events unfold in the coming days.